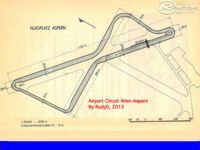 This is a freely distributable scratchbuilt track of Wien-Aspern for pc race simulators like rFactor and similar sims (GTL). V1.0 was built by RudyD in 2013. It may be converted to other sims later on. Wien-Aspern was a real-life arfield circuit in Austria, in use from about 1956 to about 1977. It's not one of the country's well-known circuits like the Salzburgring or the Oesterreichring, yet still well-known drivers like Niki Lauda and Jochen Rindt cut their teeth upon it, in junior formula like the Formule Vee, often delivering hard fights in these spec formula's on the 'Flugplatzrennen'. 1966 ergebnisse (results) give the Vee best lap of about 1:24.2, with the sports cars also about the same with a Fiat Abarth 850 about the same 1:24 too. Nevertheless, this virtual recreation of Vienna (Wien)-Aspern was made in 2013, mainly for rFactor (and also for GTL) and freely available to spread for everyone and drive for all. Conversions of this track are expressly allowed, as long as proper credit is given. The track was mainly developed and tested for rFactor (running on a Mac) and also for GTL. That is to say, here's also a version for GTR2 and maybe more variants for other sims will appear not too long after the rF version. At this time, apart from the rF and GTL versions the other versions for GTR2 etc were not exhaustively tested (only a quick check to see if it would run in these sims) because doing all those additional versions would cause me to make and test four different versions of the track, which is a bit much. So I'll plan to pack the extra versions up in an archive, leave it on the Internet somewhere and leave any new versions up to the converters. Tests were mainly done using mods as Plickbadger's Spec Miata, Vintage Formula Vee, the GTL TC-65 sports cars, GTR2 cars (Elise), Vintage Formula Ford, rF Caterham, and other lower-powered mods. To install, extract and copy the track folder to your rFactor, GTL, (and if so wished GTR2)\GameData\Locations\ folder. Ignore any MacOSX folders (.DOS etc), they're a byproduct of the Mac file system. If you'd like the AI to speed up or slow down a bit, raise or lower the Worst/Mid/Bestadjust values in the .aiw file (in the track folder) by about 0.2 at first and experiment a bit until you're happy with it. Especially in the GTL and GTR2 it's not always easy to get consistent AI behaviour, but it should help becoming the computer opponents a bit adjusting to your driving style and speed.